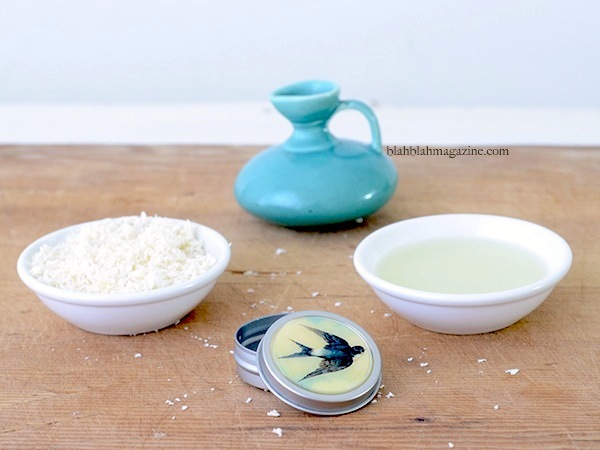 Today's post (a DIY natural perfume balm) is by Cybele of Blah Blah Magazine, a blog about uncovering a beautiful life in the simple and the unexpected without costing the earth. Everything Cybele writes is inspiring and useful- her homemade beauty treatments recipes are my latest obsession. To compose your very own signature fragrance or scented symphony for people to remember you by is a beautiful path to walk. The blend can be as complex or as simple as you choose. Many perfumes incorporate hundreds of notes yet some of the most successful perfumes are made from two or three essences. It is possible to make your own eau de toilette, however it takes six weeks of settling time before you can enjoy it, whereas your perfume balm will be ready straight away and is ideal for carrying in a handbag. To design your perfect signature fragrance, I would recommend you start by thinking about what you love. If one single essential oil stands out, feel free to use that all by itself. Otherwise, finding out the main ingredients in your favourite perfume is a good place to start. Not that you will be replicating it, but it’ll give you some good ideas. A quick Internet search tells me the main ingredients in the ever-popular Chanel No. 5 are: bergamot, lemon, neroli (orange blossom), jasmine, rose, ylang-ylang, cedar wood and vanilla. If that’s your favourite perfume, you could choose your favourite ones on the list and create your own blend. Always test the blend on your skin, as it will smell completely different in the jar and keep a note of exactly how many drops you use of each. The blend I have listed below is inspired by the delightful (and very popular) Ralph Lauren Safari, whose main notes include, lemon, lavender, cinnamon and sandalwood. Please consider it a starting block, as creating your very own fragrant identity is the ultimate aim. However this fresh and lovely perfume will help build your confidence. I have called the blend, D'été, because it reminds me of riding a bicycle through the South of France with my best friend one summer. We peddled past fields of lavender and under gnarled trees groaning with lemons. The ingredients needed are available from online aromatherapy suppliers, otherwise beeswax is often sold at health food stores and craft stores. 1. Blend the essential oils. Take time to get the balance right for you. Once you are happy put the blend to one side. 2. Combine the sweet almond or grape seed oil with beeswax in a heat resistant bowl (stainless steel or Pyrex) and warm over a saucepan of simmering water on the stove until the beeswax has melted. Remove from the heat. 3. Add the essential oil blend and stir well. Decant into containers. A pipette can make this easier. Allow to cool before using. As with any new product, please test in a small, discrete spot to check for irritation before using. 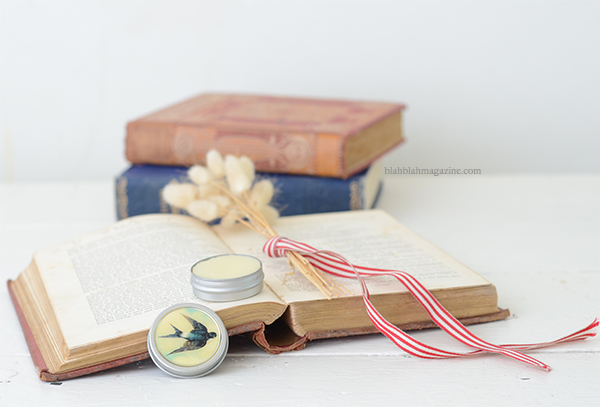 I'd love to be able to make my own lip balms, this is a great tutorial. ♥ I wish you could smell through the internet. Haha. This is simply amazing. I would love to try this. Hopefully mine comes out looking as good as yours! What a great gift idea too. I am wondering though, would it be at all possible to use some pure vanilla extract from the kitchen? I feel ignorant asking this. I cannot afford to purchase the proper extract or EO for vanilla, and that's one of the main notes on both of my favorite perfumes! I do have some EO's that I will be using, but it would definately be missing vanilla. Good question, it depends on the vanilla extract you use. The vanilla paste types with the seeds should work, but it will leave a few speckles on you when you apply. Unfortunately, one with alcohol wouldn't work in this recipe, but you've got me thinking, because it should be possible for a spray perfume, because they contain alcohol anyway. It would be worth experimenting and replacing the distilled water with vanilla extract. If you do, I'd love to hear how you go. I'm also going to play around with the E.O. amounts for the Chanel No 5 version since I happen to have all of the oils you've listed for that scent on-hand as well. (I'm a bit of an E.O. junkie).